Jeff Milton, feared by outlaws, and remembered for the Fairbank shootout. Copy photo from the collections of John D. Rose. If anyone assumed that the dawn of the 20th Century meant the days of robberies had come to an end, they weren’t reading the local news. 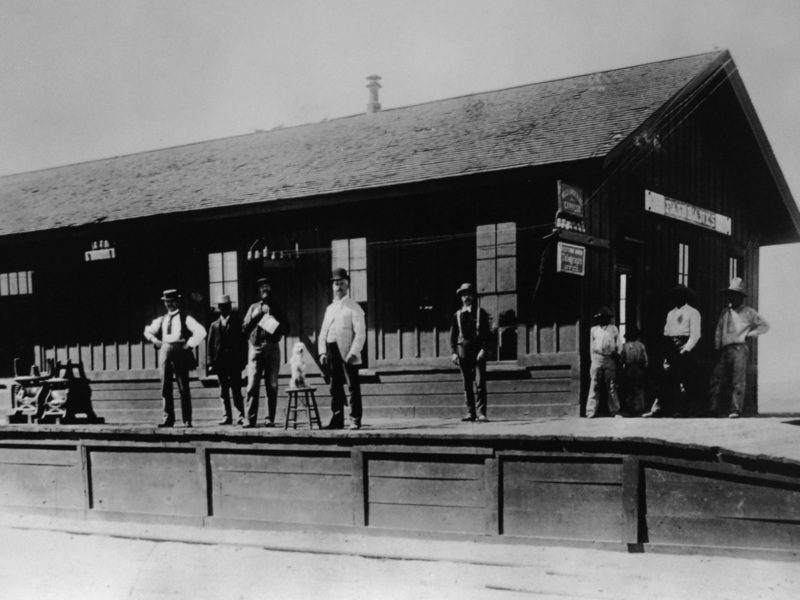 A gang of train robbers was hiding out in the area; no one knew who they were, but on September 9th, 1899, they held up a train at Cochise, a small depot outside of Wilcox, Arizona. They secured from this heist between $2,000 and $3,000. The crime remained unsolved. The gang was not identified till over one year later, in the wake of their most famous robbery in Fairbank. The New Mexico and Arizona railroad still came through the valley with regularity, moving passengers to and from Mexico, as well as massive shipments of cattle. Money moved on the railroad as well, making fine targets for bandits. An Arizona lawman and his wife were taking a ride in their car, traveling back to their ranch, when she dozed off for a nap. She suddenly was awakened. “We were driving up the last long mesa to our ranch near the Arizona border when I woke from a brief nap against my husband’s shoulder to hear him say with a chuckle, ‘They told me at the hospital that my left arm would never be anything but a useless lump of flesh, always in the way, but, by jolly, here I am driving my car with one hand and hugging my wife with the other.’ And then I learned another chapter in the story of the battle in which he won that badge of courage, his crippled arm, and the longer and harder fought struggle he made to keep it.” Though clearly written with the sentiment of a proud wife, her account describes Jeff Milton, a well-respected man of formidable reputation who had spent years on horseback chasing outlaws. A man of resolve and commitment, lawbreakers preferred to avoid him, while honest citizens were pleased to see him. “At dawn of February 15th, 1900, five men broke camp in a canyon of the Dragoon Mountains and set out to ride, by different routes, down the long treeless slope to Fairbank, Arizona, in the valley of the San Pedro. Around their campfire, the night before, they arranged to meet at dusk in the river bottom near the point where, in the summer rains, Walnut gulch pours its sudden floods into the river. And they took [a] mutual oath before parting, pledging themselves to kill the first man of them who should show fear when they came to carry out the thing they had planned to do. “Behind them, across the mountains in Wilcox and Pearce were Burt Alvord, deputy-sheriff of Cochise County, and Billy Stiles, constable, leaders of a gang of rustlers, train-robbers, and cold-blooded killers of unarmed men, for no man was allowed to live who might suspect them of complicity in the outbreak of crime in that section. “‘What’s going on around here?’ Jeff asked the clerk. ‘Just a bunch of drunken cowboys having a little joke, I reckon,’ was the reply. ‘Poor kind of joke. Apt to get somebody killed sometime,’ said Jeff, passing out another package. ‘Throw up your hands and come out of there,’ cried the voice. A shot sounded and Jeff’s Stetson [hat] left his head. “‘If there’s anything you want, come and get it,’ shouted Jeff, reaching for the sawed-off, double-barreled shotgun which stood beside the door. “Then from behind the by-standers whom they had lined up on the platform, five men, with high-powered 38.55 rifles, began pumping soft-nosed bullets at the white-shirted figure, a fine target with the light of the car at his back. “Frightened by the noise, the stage horses were prancing, and the driver, [Ed Tarbell, see following account] who had left his high perch when the train came in, started to run toward them, but was menaced by a gun and ordered to stop. A rancher, nearly half a mile down the track, heard the fusillade and got up from the suppertable and went to his barn, thinking his horses were loose in their stalls and kicking. “With his pistol at hand, Jeff might have jumped from the car and gone into the fray, but that weapon was on his desk in the rear of the car. His shot-gun would cut down friends as well as foes. So, with his shirt in ribbons, his left arm and side bleeding where they had been creased by bullets, Jeff stood helpless through those seconds which seemed like hours. Then a bullet shattered the upper bone in his left arm and, at its impact, the stalwart figure swung half-way round and crashed to the floor of the car. “As he fell, the gang left shelter and rushed the car. But Jeff, who in boyhood had learned to shoot with one hand, was not yet out of the fight. “A second bandit, with a buckshot warming the seat of his trousers, was leaving the fight and never stopped until safely across the line in Mexico. “Half-fainting, Jeff pulled the door shut. Blood was spurting into his face from his wounded arm. He fixed his left hand in the handle of a trunk, and with his right, ripped what remained of his shirt sleeve up to his shoulder, and twisted it around his arm above the wounds. Then he fainted.” In spite of the preceding moments, Milton was fortunate that he hadn’t fainted seconds earlier. If so, he would have bled to death while unconscious. With Milton unconscious, the robbers seized the opportunity, but not without caution. “Before they would risk entering the car, the three remaining bandits circled it, pouring round after round of ammunition into it. Even then, they sent the engineer of the train in ahead in case Jeff should be alive and still able to shoot. But Jeff was lying, apparently dead, between two heavy trunks, his dog whimpering over him. “Then came the voice of Homer Pricket, conductor of the train, and as friends entered the car, the realization of what had happened came to him. “Authority was received over the wire from Tucson to back the train to Benson where a special [train] met it and conveyed the wounded messenger to the hospital in Tucson. “Next morning early, an eager posse was trailing the bandits up Walnut Gulch between Tombstone and the Dragoons. In the foot-hills at Buckshot Springs, they found Three Fingered Dunlap, abandoned by his companions and left to die. In extreme anguish, the terribly wounded man had begged them not to leave him, but they were determined to go on without him. Then he implored them to put him out of his misery, swearing he would give the gang’s secret away if he were found alive. But they felt sure he had only a few minutes of life remaining and continued their flight. “Three Fingered Jack lived for several days after being removed to Tombstone and made good his threat, implicating the two Owens boys, Bob Brown, and Bravo Juan, the man who had ‘hightailed it’ to Mexico, as well as Billy Styles and Burt Alvord, who, though not present, had planned the robbery. “It was difficult, at first, for people to believe that these two men, respected in the community, could be concerned in the violence of the past months, but on Jack’s testimony, the members of the gang were arrested and put in jail in Tombstone….Meanwhile, in Tucson, and later in San Francisco, Jeff was fighting to save his arm from amputation. Several inches of bone had been shattered and the doctors agreed he could not live unless the arm were removed at the shoulder, but Jeff felt he would rather be dead than to live with only one arm. “One day his long-time friend, Frank King, was calling on him in the Tucson hospital. Jeff said, ‘King, get my six-shooter out of my bag and put it under my pillow. I’ll feel better with it there.’” Milton’s wounds would not heal, so his attending doctor, H. W. Fenner, sent him to the Southern Pacific Hospital in San Francisco. “When next the doctor, also an old friend, came in, Jeff explained that it wouldn’t be safe for anyone to try to amputate his arm. He had been lying in the hospital in San Francisco for nearly eight months and had grown to be on good terms with the staff, when the head surgeon came into his room one day and sat down for a chat. They talked aimlessly for a time and then the doctor asked, ‘Have you ever made your will, Milton?’” By this time his arm was stinking and his left leg swollen the size of his body. “Jeff tried to show polite interest in what he felt did not concern him, but was startled into closest attention at the next words. “At that Jeff rang the bell and when the nurse came in told her to have his bill made out. “The morning after the hold-up in Fairbank, Dr. Goodfellow saw an account of the fight in the papers and wired Wells Fargo’s office in Tucson. He learned Jeff had been operated on, the surgeons having cleaned the wound and attempted to reconstruct the missing framework from piano wire. “The surgeon made good on his word, and eventually Jeff returned to Nogales, but with his left arm hanging helpless, the fingers of the hand tightly clenched, and even Dr. Goodfellow holding out no hope that hand and arm would ever [be] useful again. “A man living in Nogales at the time says Jeff’s determination to regain the use of hand and arm, and the persistence of his efforts, together with the success which crowned them, will always be a lesson in the overcoming of handicaps. With several inches of the bone missing above the elbow joint, his arm had shortened. To his wrist Jeff tied a money sack filled with No. 8 shot. This hung just right to dangle against his closed fingers as he walked, and was a constant reminder to him to struggle with will and muscle to move the fingers and catch hold of the bag. The day came when his fingers made response, and in time they regained their normal strength and freedom of motion. ONE ROBBER CAUGHT ‘Three Fingered Jack’ is Wounded and Run Down By the Posse. Train depot at Fairbank. The sign at the front of the building identifies Fairbank as Fairbanks. Stages left from the side of the building shown, and the railroad arrived on the opposite side. Copy photo from the collections of John D. Rose. “Fairbank was the scene of a hold up last night, three masked men armed to the teeth making a raid on the N.M. & A, train just as the north bound passenger train pulled into and stopped at the station. The movements of the robbers and their methods would indicate that they were no novices in their work, exhibiting plenty of nerve and reckless courage and during their brief stay made things very exciting as a hold up usually is. The robbers secured but little booty for their trouble and although various reports are given out as to the amount of money secured it is authentically stated that but one package, containing $17 in Mexican money, which happened to be out of the safe in the express car is missing. “The particulars as learned by the Prospector from several eye witnesses is to the effect that as soon as the train stopped and the agents and helpers were busy unloading and loading mail and express matter, three men were seen to emerge from the side of the depot platform. One of the three men went to the engine and the other two hurried to the express car, ordering everybody to throw up their hands and immediately began shooting by way of enforcing the order. The bystanders, with hands aloft, were somewhat scattered and the leader commanded all to ‘bunch up’ punctuating his remarks with comprehensive profanity. It is needless to say all hastened to obey. Presently the engineer and fireman came from their post and were marched to the crowd w[h]ere they were also commanded to remain with hands up. The first robber who stopped at the engine had marched the two railroaders to the crowd at the point of a pistol. “Meanwhile a fussil[l]ade of shots was kept up and the mail and express car was perforated with shots. Express Messenger J.D. [Jeff] Milton appeared at the door of his car with a Winchester and began firing at the robbers. At the first fire from Milton one of the robbers was positively seen to fall to the ground. Whether he was wounded or not is not known but he returned the fire as did also the others, when suddenly Milton dropped having been shot in the right arm. At this exciting moment the horses on the Tombstone stage, who were nearby, became frightened from the shooting and started to run away. Driver Ed Tarbell, who was in the ‘bunched’ crowd started to head them off when one of the robbers sternly ordered him to halt, Ed wisely halted. Then the robber who had fallen to the ground as stated above, fired several shots at the fleeing animals, one bullet taking effect…and effectually stopped the runaway although at the probable cost of the horse which may die. “The leader of the robbers then turned his attention to the depot and inquired of the ‘crowd’ where the agent was. Agent Gay was in the ‘bunched crowd’ but discretly [sic] kept silent and none of the others cared to impart…his whereabouts. With another voluminous outburst of profanity, the robber went to the door of the depot which was locked. He kicked down the door, walked in, found all the safes locked and came out empty handed. The three robbers walked off together going west of the depot where it is presumed they had horses ready in waiting. “The train immediately backed to Benson for medical assistance for Messenger Milton. It is understood the bones in his arm are so shattered that amputation will be necessary. The injury to Milton is to be regretted. He was a brave and efficient officer and well know[n] here. The case would break open quickly. “LATER. Just as we go to press Deputy Sheriff Geo [George] Bravin arrived with the information that one of the robbers was found and proved to be Three Fingered Jack, the notorious character who was recently released from the county jail here [Tombstone]. Jack was found shot in the abdomen being the wound he received from Messenger Milton during the hold up. ” One by one, the robbers were hunted down and brought to justice. “The examination of Thos Yoea, otherwise known as ‘Bravo John’ on U S charge of obstructing U.S. mail was had before Commissioner Emanuel this afternoon. ‘Bravo John’ had no attorney and did not care for one. ‘Bravo John’ is charged with being one of the five who held up the…train at Fairbank on Feb 15th. There were but three witnesses for the prosecution, Ed Tarbell whose testimony was to show that he witnessed the hold up. Deputy Sheriff Mullen one of the posse on the trail of the robbers told of the chase and running onto Three Fingered Jack lying wounded on the prairie. The deputy told of Three Fingered Jack’s dying statement saying that the Owing Brothers, Bravo John, John Brown and himself had robbed the train. ‘Bravo John’ was identified as the man referred to by Three Fingered Jack. “W N [William,aka, Billy] Stiles, the confessed train robber in the Cochise holdup, was also an important witness in this case. He stated that he [had] seen the five men just named, at a ranch in the valley and they informed him that the party proposed to hold up the train at Fairbank on the night that the robbery was committed. The Owing Brothers had told him that they just sold their cattle and proposed making a haul and get out of the country. ‘Bravo John’ was present and one of the number. “When the prisoner was asked if he cared to question witnesses he replied no and also refused to make any statement. Court Commissioner Emanuel held the prisoner over to await the action of the grand jury under bond of $10,000. “The cases of Owing Bros and Bravo John also Downing and Alvord under territorial charges of trainrobbery will come up tomorrow. Cochise County’s train robbing lawman, Burt Alvord. Copy photo from the collections of John D. Rose. “About 3 p m Tombstone was thrown into a fever of excitement, the like of which has not visited our city since the days of the hanging of [John] Heath by an indignant mob. The occasion for this was the news of a jail break at the county jail and the shooting of Deputy Sheriff Geo Bravin who was wounded in an attempt to block the break for liberty. “Despite the most precautionary measures taken by the Sheriff’s office to guard against any attack of friends of the prisoners in jail on [the] charge of train robbery to secure their release by force, as was feared, the expected happened, but from a source that was never suspicioned, the dastardly work being done by Wm Stiles, the self confessed train robber who turned states evidence against his pals, then further proved his treachery by attempting to help them escape from jail, even at the sacrifice of the lives of any who might stand in the way. Fortunately the brave Deputy Sheriff, Geo Bravin, was not killed though he had a most narrow escape. “Last evening Matt Burts was brought over from the Tucson jail for his preliminary examination here for train robbery. Wm Stiles the principal witness who turned states evidence, also arrived to testify. It was deemed advisable by the authorities and prosecution not to place Burts in jail in company with the other prisoners on some charge for reasons that are obvious. As a consequence Burts was under guard of the two deputies. His trial was to be had today and was again to be taken to the Tucson jail tomorrow. “While the guards were away from the jail with Burts, Deputy Sheriff Bravin was left alone in charge of the jail. Wm Stiles, who, up to this time had helped the officers in everyway to prosecute his pals, and who was believed to be the last man to even think of aiding in a jail break, suddenly pushed a six shooter at Deputy Bravin, while in the front jail room and commanded him to deliver the keys of the jail. Bravin was unarmed…Bravin…knocked at the pistol of his assailant. At the same time Stiles shot and the Deputy fell. Stiles in an instant secured the keys and opened the main cell doors inviting all the prisoners to make a break for liberty. Burt Alvord and ‘Bravo John’ both charged with train robbery came out and, rushing to the front with Stiles, took three Winchester rifles and two six shooters…and hurriedly left, the three going down Fremont street to the ranch of John Escapule below town where they stole two horses, grazing near, and rode off toward the Dragoons two of the men riding one horse. “The opportunity to escape was offered to the entire 24 prisoners in jail. As the Halderman brothers came out, Deputy Bravin spoke to them saying kindly that they better not attempt escape as they would not have time to get away. Both of the condemned men said: ‘all right George, we’ll stay.’ Wm Downing one of the accused train robbers refused to go at all as was also the case of the Owen brothers under the same charge: Sid Page also remained inside. Several of the other prisoners started to go and one prisoner named Griffith, at the request of the deputy, closed the iron door bars. “The Halderman brothers seeing the wounded condition of the deputy, together with the other prisoners, carried him to a bed in the ante room and endeavored to relieve his pains. “A few minutes after the escape several posses were in pursuit and are believed to be but a short distance behind the three fugitives. Many determined men offered their services and were sent out. The feeling runs high and should the escape[e]s be recaptured the probability for a lynching is exceedingly good. “…there was a sensation in the district court at Tucson yesterday when George Owings confessed the charge of train robbery in which he was implicated with Brown and several others. It was during the trial of Brown, the man who is said to be the leader of the band…Owings took the step he did without solicitation, it was as much a surprise to the district attorney as to the crowd that assembled in the court room to witness the trial. “The confession was complete, the story was told with graphic effect, every detail and circumstance of the Fairbank holdup, the days of planning, the craftiness of Burt Alvord in providing protection for the men who were to take part in the affair, the preparation for the first nefarious work of the band which was to be but a beginning of a series of holdups. It was a scene which might form the foundation for a yellow-back novel, and the story would be one of more, than ordinary interest in thrilling scenes and picturesque description. By the following December Billy Stiles and Matt Burts were back in custody and testifying at the Downing hearing. It revealed a remarkable tail of outlawry, theft, treachery, and proof that this was not the happiest bunch of criminals, nor did they all get along with each other. Matt Burts admitted that “He would like to see Downing’s neck broke.” Stiles made light of his treachery to the authorities who had trusted him saying “…the whole matter of the Cochise county jail delivery was gone over.” The Stiles Alvord gang would long be remembered less for their crimes, and more for the treachery of Billy Stiles, who betrayed his outlaw comrades by first testifying against them, gaining the trust of Deputy Sheriff Bravin, and then shooting him in favor of their escape. Jeff Milton would remain a lawman, later bringing to justice the perpetrator of a bank robbery in Tombstone. The above information is in part excerpted from On the Road to Tombstone, by John D. Rose, published in 2012. 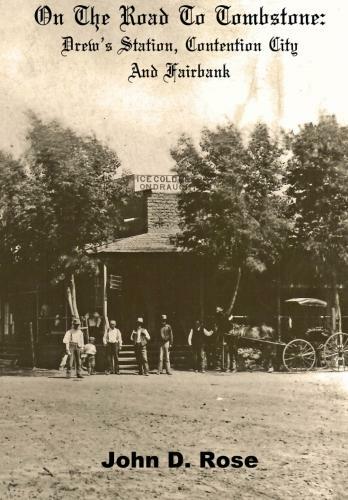 This is the first book devoted in great detail to not only the Fairbank Train Robbery, but also the town of Fairbank, Contention City, and legendary Drew’s Station. For more on this story and other research breakthroughs, this book is available at https://www.createspace.com/3952635 as well as Amazon.com. Copyright John D. Rose, 2015, 2016, 2017, 2018. All rights reserved.